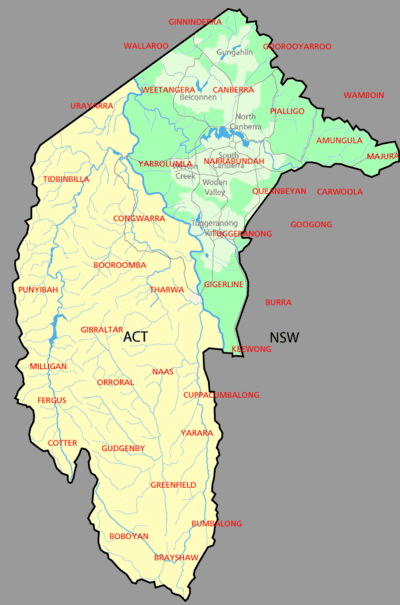 The Australian Capital Territory (ACT; known as the Federal Capital Territory until 1938) is Australia's federal district, located in the south-east of the country and enclaved within the state of New South Wales. It contains Canberra, the capital city of Australia. Geographically, the territory is bounded by the Goulburn-Cooma railway line in the east, the watershed of Naas Creek in the south, the watershed of the Cotter River in the west, and the watershed of the Molonglo River in the north-east. The ACT also has a small strip of territory around the southern end of the Beecroft Peninsula, which is the northern headland of Jervis Bay. The need for a national territory was flagged by colonial delegates during the Federation conventions of the late 19th century. Section 125 of the Australian Constitution provided that, following Federation in 1901, land would be ceded freely to the new Federal Government. The territory was transferred to the Commonwealth by the state of New South Wales in 1911, two years prior to the naming of Canberra as the national capital in 1913. The floral emblem of the ACT is the royal bluebell and the bird emblem is the gang-gang cockatoo. The economic activity of the Australian Capital Territory is heavily concentrated around Canberra. A stable housing market, steady employment and rapid population growth in the 21st century have led to economic prosperity and in 2011 CommSec ranked the ACT as the second best performing economic region in the country. This trend continued into 2016, when the territory was ranked the third best performing out of all of Australia's states and territories. There is a higher proportion of young adults in the region compared with other Australian states or territories. Approximately one-fifth of ACT residents were born outside of Australia, mainly in the United Kingdom. Almost one-fifth speak a language other than English at home, the most common being Chinese. The ACT is bounded by the Goulburn-Cooma railway line in the east, the watershed of Naas Creek in the south, the watershed of the Cotter River in the west, and the watershed of the Molonglo River in the north-east. The ACT also has a small strip of territory around the southern end of the Beecroft Peninsula, which is the northern headland of Jervis Bay. Apart from the city of Canberra, the Australian Capital Territory also contains agricultural land (sheep, dairy cattle, vineyards and small amounts of crops) and a large area of national park (Namadgi National Park), much of it mountainous and forested. Small townships and communities located within the ACT include Williamsdale, Naas, Uriarra, Tharwa and Hall. Tidbinbilla is a locality to the south-west of Canberra that features the Tidbinbilla Nature Reserve and the Canberra Deep Space Communication Complex, operated by the United States' National Aeronautics and Space Administration (NASA) as part of its Deep Space Network. There are a large range of mountains, rivers and creeks in the Namadgi National Park. These include the Naas and Murrumbidgee Rivers. Because of its elevation 650 metres (2,130 ft) and distance from the coast, the Australian Capital Territory experiences four distinct seasons, unlike many other Australian cities whose climates are moderated by the sea. Canberra is noted for its warm to hot, dry summers, and cold winters with occasional fog and frequent frosts. Many of the higher mountains in the territory's south-west are snow-covered for at least part of the winter. Thunderstorms can occur between October and March, and annual rainfall is 623 mm (24.5 in), with rainfall highest in spring and summer and lowest in winter. The highest maximum temperature recorded in the ACT was 42.8 °C (109.0 °F) at Acton on 11 January 1939. The lowest minimum temperature was −14.6 °C (5.7 °F) at Gudgenby on 11 July 1971.
Notable geological formations in the Australian Capital Territory include the Canberra Formation, the Pittman Formation, Black Mountain Sandstone and State Circle Shale. In the 1840s fossils of brachiopods and trilobites from the Silurian period were discovered at Woolshed Creek near Duntroon. At the time, these were the oldest fossils discovered in Australia, though this record has now been far surpassed. Other specific geological places of interest include the State Circle cutting and the Deakin anticline. The oldest rocks in the ACT date from the Ordovician around 480 million years ago. During this period the region along with most of Eastern Australia was part of the ocean floor; formations from this period include the Black Mountain Sandstone formation and the Pittman Formation consisting largely of quartz-rich sandstone, siltstone and shale. These formations became exposed when the ocean floor was raised by a major volcanic activity in the Devonian forming much of the east coast of Australia. The ACT has internal self-government, but Australia's Constitution does not afford the territory government the full legislative independence provided to Australian states. Laws are made in a 25-member Legislative Assembly that combines both state and local government functions (prior to 2016, the Assembly was made up of 17 members). Members of the Legislative Assembly are elected via the Hare Clarke system. The ACT Chief Minister (currently Andrew Barr, Australian Labor Party) is elected by members of the ACT Assembly. The ACT Government Chief Minister is a member of the Council of Australian Governments. Unlike other self-governing Australian territories (for example, the Northern Territory), the ACT does not have an Administrator. The Crown is represented by the Australian Governor-General in the government of the ACT. Until 4 December 2011, the decisions of the assembly could be overruled by the Governor-General (effectively by the national government) under section 35 of the Australian Capital Territory (Self-Government) Act 1988, although the federal parliament voted in 2011 to abolish this veto power, instead requiring a majority of both houses of the federal parliament to override an enactment of the ACT. The Chief Minister performs many of the roles that a state governor normally holds in the context of a state; however, the Speaker of the Legislative Assembly gazettes the laws and summons meetings of the Assembly. In Australia's Federal Parliament, the ACT is represented by four federal members: two members of the House of Representatives represent the Division of Fenner and the Division of Canberra and it is one of only two territories to be represented in the Senate, with two Senators (the other being the Northern Territory). The Member for Fenner and the ACT Senators also represent the constituents of the Jervis Bay Territory. In 1915 the Jervis Bay Territory Acceptance Act 1915 created the Jervis Bay Territory as an annexe to the Australian Capital Territory. In 1988, when the ACT gained self-government, Jervis Bay became a separate territory administered by the Australian Government Minister responsible for Territories, presently the Minister for Home Affairs. The ACT retains a small area of territory on the coast on the Beecroft Peninsula, consisting of a strip of coastline around the northern headland of Jervis Bay (not to be confused with the Jervis Bay Territory, which is on the southern headland of the Bay). The ACT's land on the Beecroft Peninsula is an "exclave", that is, an area of territory not physically connected to the main part of the ACT. Interestingly, this ACT exclave surrounds a small exclave of NSW territory, namely the Point Perpendicular lighthouse which is at the southern tip of the Beecroft Peninsula. The lighthouse and its grounds are New South Wales territory, but cut off from the rest of the state by the strip of ACT land. 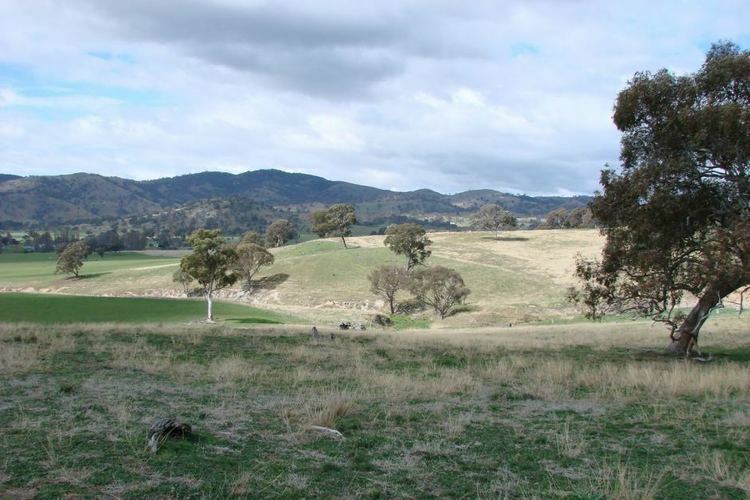 This is a geographic curiosity: an exclave of NSW land enclosed by an exclave of ACT land. At the 2016 census, the population of the ACT was 397,397 of whom most lived in Canberra. The ACT median weekly income for people aged over 15 was $1000 while the national average was $662. The average level of degree qualification in the ACT is higher than the national average. Within the ACT 4.5% of the population have a postgraduate degree compared to 1.8% across the whole of Australia. Canberra is a planned city that was originally designed by Walter Burley Griffin, a major 20th century American architect. Major roads follow a wheel-and-spoke pattern rather than a grid. The city centre is laid out on two perpendicular axes: a water axis stretching along Lake Burley Griffin, and a ceremonial land axis stretching from Parliament House on Capital Hill north-eastward along Anzac Parade to the Australian War Memorial at the foot of Mount Ainslie. The area known as the Parliamentary Triangle is formed by three of Burley Griffin's axes, stretching from Capital Hill along Commonwealth Avenue to the Civic Centre around City Hill, along Constitution Avenue to the Defence precinct on Russell Hill, and along Kings Avenue back to Capital Hill. The larger scheme of Canberra's layout is based on the three peaks surrounding the city, Mount Ainslie, Black Mountain, and Red Hill. The main symmetrical axis of the city is along Anzac Parade and roughly on the line between Mount Ainslie and Bimberi Peak. Bimberi Peak being the highest mountain in the ACT approximately 52 km (32 mi) south west of Canberra . The precise alignment of Anzac parade is between Mount Ainslie and Capital Hill (formally Kurrajong Hill). The Griffins assigned spiritual values to Mount Ainslie, Black Mountain, and Red Hill and originally planned to cover each of these in flowers. That way each hill would be covered with a single, primary color which represented its spiritual value. This part of their plan never came to fruition. In fact, WWI interrupted the construction and some conflicts after the war made it a difficult process for the Griffins. Nevertheless, Canberra stands halfway between the ski slopes and the beach. It enjoys a natural cooling from geophysical factors. The North and South Canberra districts are substantially based on Walter Burley Griffin's designs. In 1967 the then National Capital Development Commission adopted the "Y Plan" which laid out future urban development in Canberra around a series of central shopping and commercial area known as the 'town centres' linked by freeways, the layout of which roughly resembled the shape of the letter Y, with Tuggeranong at the base of the Y and Belconnen and Gungahlin located at the ends of the arms of the Y. Development in Canberra has been closely regulated by government, both through the town planning process, but also through the use of crown lease terms that have tightly limited the use of parcels of land. All land in the ACT is held on 99 year leases from the national government, although most leases are now administered by the Territory government. Most suburbs have their own local shops, and are located close to a larger shopping centre serving a group of suburbs. Community facilities and schools are often also located near local shops or group shopping centres. Many of Canberra's suburbs are named after former Prime Ministers, famous Australians, early settlers, or use Aboriginal words for their title. Street names typically follow a particular theme; for example, the streets of Duffy are named after Australian dams and reservoirs, the streets of Dunlop are named after Australian inventions, inventors and artists and the streets of Page are named after biologists and naturalists. Most diplomatic missions are located in the suburbs of Yarralumla, Deakin and O'Malley. There are three light industrial areas: the suburbs of Fyshwick, Mitchell and Hume. As of May 2004, 30% of people in the ACT aged 15–64 had a level of educational attainment equal to at least a bachelor's degree, significantly higher than the national average of 19%. The two main tertiary institutions are the Australian National University (ANU) in Acton and the University of Canberra (UC) in Bruce. There are also two religious university campuses in Canberra: Signadou is a campus of the Australian Catholic University and St Mark's Theological College is a campus of Charles Sturt University. Tertiary level vocational education is also available through the multi-campus Canberra Institute of Technology.